Nationals 2017 will be held in Columbus, OH, at the Greater Columbus Convention Center from April 6th to 8th, 2017. While rooms have filled up at the Crowne and Hilton, more rooms have just been added at the Double Tree, the Westin, and Springhill Suites. If the hotel you are trying to reserve is full, you may reserve another hotel, and add yourself to the waitlist for your first choice of hotel. If something becomes available, your reservation will automatically be moved per your waitlist request. You can reserve your room by booking at this link. Please note that all booking is done through National Travel Events (NTS), not the hotel. If you made a reservation through NTS, the hotel will NOT have information on your reservation until after the NTS reservation deadline. Located just one block from the Hilton and the Columbus Convention Center, making it the perfect breakfast, lunch or dinner spot during Nationals! There are over thirty merchants that serve authentic foods from around the world. They are open Wednesday – Saturday from 9am – 7pm and Sunday from 10am – 5pm. A stretch of High Street home to cute boutiques, art galleries and tons of restaurants. Just a five minute walk from the Greater Columbus Convention Center. Historic neighborhood just a ten minute drive from the Greater Columbus Convention Center with lots of restaurants, shops and art galleries. Also home to The Book Loft - a unique bookstore with 32 rooms of books! Located right in Downtown Columbus on the Scioto River, the Scioto Mile has beautiful paths and fountains that make for a relaxing way to spend time outside. There are also bikes from the CoGo bike sharing program that can be rented by the day. The COSI is an awesome and interactive science center. They have many different exhibits and admission is $20. COSI is about a 10 minute walk from the Greater Columbus Convention Center. About a 15 minute drive from the Greater Columbus Convention Center, Franklin Park Conservatory is home to beautiful gardens, butterflies, plant and art collections. Sections are divided by climate and landscape. Admission is $14. Looking for somewhere to eat? 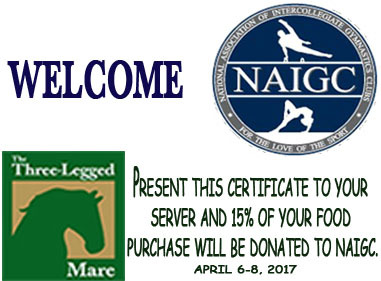 The NAIGC will get 15% back from every purchase made at the Three Legged Mare, or Pastaria or Sarefino's in the North Market. Finally, there is a Rhythmic Gymnastics Competition in the Battelle Grand Ballroom of the Convention Center going on Friday and Saturday morning. 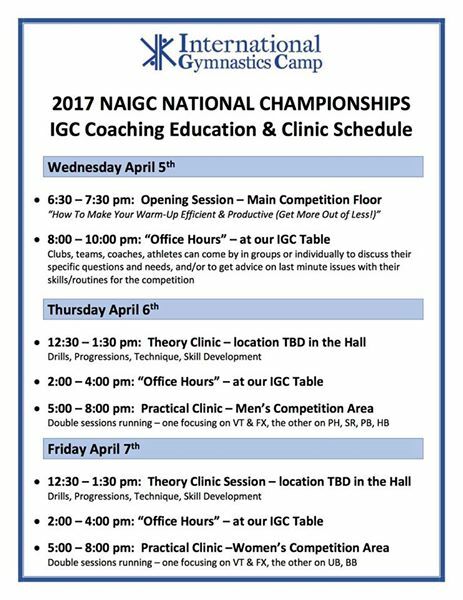 All NAIGC gymnasts with their credentials are welcomed to attend free of charge! Nationals 2017 fees include individual registration fees, and team fees if competing as a team. These fees are in addition to the NAIGC membership fees (described above). Each club must pay an individual fee for each individual competitor, as well as a team fee for each team that is entered into the team competition. The individual competitor fee includes a t-shirt automatically. $80 for early bird registration paid / postmarked by February 1, 2017. $90 for regular registration paid / postmarked between February 1 and March 1, 2017. $110 for late registration paid / postmarked after March 1, 2017. **If you do not pay by March 20th, you are not guaranteed entry into the competition. $100 paid / postmarked by March 1, 2017. $125 paid / postmarked after March 1, 2017. ** If you do not pay by March 20th, you are not guaranteed entry into the competition. International Gymnastics Camp will be offering a series of clinics and office hours during the meet! See their schedule here.